Surpassed $1 million in net worth by age 40 – while raising a young family – check. A pioneer in Canadian personal finance blogging – check. Impressive stuff from FrugalTrader, the founder and owner of the ever-popular blog Million Dollar Journey (MDJ). I’m certainly a fan. MDJ was one of the first blogs I followed in my younger years, before I had this site. That was a short 10 years ago! Part of the reason why I invest the way I do, why I post monthly updates on this site, like this one, is because I was motivated by Million Dollar Journey’s dividend income approach to investing. Years later, I consider him a friend while an ongoing inspiration as my wife and I pursue our own financial dreams. In recent weeks on the site, I’ve posted some updates from various dividend investors – highlighting how things have changed in the last four years since I asked them, in detail, about their dividend income journey. We have Tawcan making close to $19,000 per year now. We have The Dividend Guy now running his own online business (since he was able to quit his job). We have Dividend Earner telling us he’s churning out about $20,000 per year. We read about Dividend Growth Investor who considers himself financially independent. And now we have FrugalTrader’s update, the final in this series. Read on, since I last interviewed him back in 2015. Welcome back to the site…I know we’ve talked quite a bit over many emails over the years but I was curious for my readers out there – what has changed since 2015 (since our post together)? Well hello everyone and thank you Mark for the opportunity to share my story with your readers. For those that don’t yet follow my site, as a quick backgrounder, I am the founder, editor, and primary author at MillionDollarJourney.com (I go by FrugalTrader online). My site started in 2006 which tracked my journey to $1 million in net worth by the age of 35 (achieved in 2014). In terms of investing Mark, your readers should know I started with mutual funds in my teens, but got more serious about building a portfolio after graduating from University (in 2003). Even though tracking net worth has been a big part of my financial journey (even though I know you don’t do it in detail based on your post here! ), I really focus on a more important goal – the goal of financial freedom. That is, when my family has enough sources of passive income to cover regular monthly expenses. For our family of four, that’s around $55,000 to $60,000 per year. To generate passive income, dividend growth investing attracted my attention as an efficient and easy way to not only produce passive income but also to grow wealth. When picking dividend stocks, I tend to focus on their dividend history and how the position fits within my portfolio. I look at criteria such as, how long they’ve been paying a dividend, consecutive years of dividend increases, and their dividend track record during tough times (dot com bust, financial crisis etc.). I also read financial statements and annual reports to ensure that their dividends and earnings are sustainable. Companies that have a history of dividend growth are generally large blue chip companies that have the ability to grow their earnings year after year through their competitive advantage in the marketplace. Since 2015 Mark, not that much has changed except that my dividend portfolio has gotten quite bit larger! More on this below. Perfect segue, so how is your portfolio constructed now? What do you own? 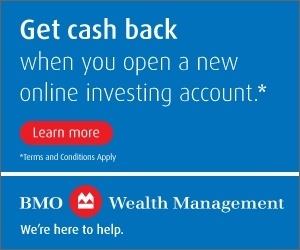 What accounts are you investing in? As I mentioned above, I’m a big fan of dividend investing, but I’m also a fan of index investing for the diversification. I know we feel the same on this. As a total portfolio (between me and my spouse), we own dividend growth stocks along with U.S./international ETFs. Most of our Canadian exposure is in Canadian dividend stocks with our U.S. exposure that is a mixture of U.S. dividend growth stocks and index ETFs, and international exposure through ETFs. For tax efficiency, we hold our U.S./international positions in our RRSP/TFSA. Since those accounts are mostly maxed out, we have our Canadian exposure in non-registered accounts. Otherwise, I would suggest keeping everything in a tax-sheltered account. Makes sense to me! How close are you to achieving your dividend income goal? How much more to be invested and/or time will it take to realize your dividend income goal? Our big goal of generating $60k by 2020 has not changed and we are chugging along. In 2015, we reported that we were generating around $16,000/year in dividend income. In my most recent December 2018 update, we reported $46,100 in dividend income! In my mind, we are on track to earn $60k in dividend income by the end of 2020, but you never know what will happen between now and then. I plan on staying focused on increasing our dividend income at least until we hit our goal. Your readers can check out my Q4 December 2018 update here. Geez, amazing. Are you going to do anything differently going forward to help you realize your goal? We continue to make saving a priority which is then used to continue growing our portfolio. All of our passive income right now is from publicly traded equities. Ideally, I’d like to have a little more diversification and may look into private equity going forward. But dividends really suit my personality – just set it and forget it! Me too. So what do you think the biggest factor will be in helping you realize your goal? There are a few factors to continue increasing my dividend income. As previously mentioned, we make saving a priority and using the proceeds to buy dividend growth stocks when they appear to be fairly or undervalued. As the portfolio has been growing, one surprise is the impact of dividend growth. For instance, one of my positions recently announced a 10% increase in their dividend, which boosted my dividend income by $100/year, possibly for life! Savings combined with dividend growth and rotating lower yielding positions to higher (but sustainable) yielding positions will help in reaching my goal in the next couple of years. At least that is the plan! Thanks again for sharing my story with your readers Mark and if they have any questions, happy to help answer! All the best to you and we’ll talk soon. I mean, approaching $50k per year in dividend income without spending a penny from the portfolio? Before age 40? *Mind-blown*. FrugalTrader is one driven, very successful man with a plan. I’ve been a fan of his site, his approach and a student of his success for years. I only wish him and his family the best in the years to come. Thanks for coming by the site again. What questions do you have for FrugalTrader at Million Dollar Journey? Share away. 11 Responses to "Why living off dividends still works for me – Million Dollar Journey"
Great story MDJ/Frugal Trader. A fine example for a lot more Canadian investors and families to emulate, or at least learn something from. Well done and all the best on your journey from another Atlantic Canadian. Impressive to say the least! Thanks for the kind feedback RBull! All well and good about the investment but nobody ever talks about the taxes that must be paid. I am recently retired and have a pension and taxes are by far my biggest expense as my house is paid off. I have no control over my pension, the gov’t deducts monthly taxes from that, no problem there. My investments are what causes me my biggest headache at tax time. T 4RIF, T5, and T5008 slips all contribute to almost double my pension, hence a huge tax bill. Now in my third year of retirement, I have a letter from CRA notifying me of my 2019 quarterly contributions that I must pay since my tax bill is so large. I use Turbo Tax and Studio Tax to do my taxes as well as the CRA booklet which I fill out by hand just to make sure that I am getting every tax break that I can but they all end up pretty much the same with me paying a significant amount of taxes. As my Dad says its a good position to be in but I almost feel like packing in all of the investments when I see how much I pay out in fees (to Robo Advisors), taxes and the mind blowing effort of just filing my taxes. Something to plan for in your future. I am even now contemplating just converting all of my investments into an annuity just to make my tax filing easier! and to stop paying everyone else fees…. You’re right….they probably don’t. I think, although I do not know for sure, MDJ has a sizable non-reg. portfolio and that portfolio is managed under a corporate structure – with his small business. This way at least, he is reducing his tax burden on dividends. For you and I, any taxation of dividends is an issue – arguably a large one for you! That said, a “tax problem” in retirement is a great position to be in; health considerations, other to keep in mind. I only hope I have to figure out multiple ways to minimize taxes in my 50s and 60s and beyond. It will mean I saved enough! Curious, are you using any software to help manage your portfolio draw-down plans? I think on the subject of annuities…I have an article coming up next week on that so stay tuned! Thanks for the comment James. As others have mentioned, having a tax problem in retirement is certainly a good problem to have! To reduce the burden, have you considered using an accountant to handle your taxes on an annual basis? Pay someone a few hundred dollars to do the taxes. 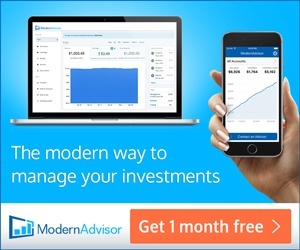 Ditch the robo-advisors and save on the 0.5% fees. For those with a longer time frame, they can shield more of their investments over time via the TFSA. Two adults equals give $12,000 room per year -> $480 (at 4% yield) income potential (not adjusted for growth). I don’t see how annuities reduce taxation burden (either monetary or paper work). It may only appear so as the return of capital portion is not taxed. 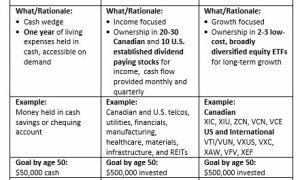 An all-in-one ETF will generate one or two tax forms, as will the annuity, as will a whole non-registered dividend portfolio. I’ve been reading your posts on and off for the last few years. Always enjoy seeing how others are doing and it is good to see I am not the only one going in this direction. I started managing my own portfolio about 6 years ago and had no previous experience prior to that time. I did save and invest in mutual funds or company stock but I didn’t have the day to day active management I started doing. I started because I really became aware that a lot of times the people I was dealing with didn’t know more than I did, they were just sales people and didn’t know about the market. They were selling a product and getting a commission. Today, I am earning just under $24k a year in dividends. My goal is to increase that to $30k by the end of 2019. I also know from tracking my expenses in detail over the years that my lifestyle takes between $36k and $40k per year to live. I have one debt to pay off and when I do my expenses will be reduced by almost $8k per year. Keep up the good work, I look forward to reading more of your articles in the future. I like reading about other investor journeys as well – more than my own! Unfortunately, most of the financial industry is based on this: “They were selling a product and getting a commission.” Buyer always beware! Earning $24k per year in dividends is no small feat. Well done. Our goal, as you know, within our TFSAs and non-reg. is to earn $30K per year. We’re confident once we reach that (no including RRSP assets, pension, etc.) that will be “enough” to semi-retire on. Thanks for being a big fan of the journey. Keep me/us posted on your progress. I always go back and forth on how much of my invested assets should be centered on high dividend funds. The problem is I will be a retired in my mid 30’s and will need growth in my account which seems to be given up some in dividend centric stocks. Dividends are that magical sure bet even during a downturn though, all of this is what makes investing so beautiful! Retired in your 30s is outstanding if that was your goal – impressive. I certainly have enjoyed seeing the cash roll in without sweating (too much) about the stock price. I find dividends really help me with my investing behaviour and I suspect beyond the high, tangible income for FrugalTrader, the same psychology has helped him achieve some tremendous income levels at such a young age.